Immunogen: Synaptic vesicle-containing fractions immunoprecipitated from human brain homogenates using anti-human Synaptophysin monoclonal antibodies. Application Notes: Detects a band of ~18kDa by Western blot. Scientific Background: Vesicle-associated membrane protein (VAMP), also known as synaptobrevin, is an 18 kDa integral membrane protein localized to the cytoplasmic surface of synaptic vesicles. Two VAMP homologs, VAMP1 and VAMP2, are differentially expressed in the nervous system. VAMP2 is found in neurons associated with autonomic, sensory and integrative functions, and in non-neuronal Langerhans islets and glomerular cells. 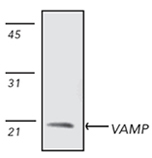 VAMP is a component of a 20S complex implicated in vesicle docking and fusion, the formation of which involves the interaction of VAMP with syntaxin through an ATP-dependent reaction modulated by synaptotagmin, SNAP-25, alpha-SNAP, and NSF. Immunohistochemistry analysis of Xenopus embryonic brain, stained with VAMP2, mAb (SP10). Immunohistochemistry analysis of human neuroblastoma tissue immunohistochemically stained using VAMP mAb (SP10) at a dilution of 1:50. Western blot analysis of mouse brain tissue extract (Prod. No. ADI-LYT-MB100) probed with VAMP2 (Synaptobrevin) mAb.